Christmas dinner is a big deal at my house. We happily host dinner for our extended family each year and this year will be the same. Our menu has evolved over the years but there are essential items that are not allowed to change due to their unwavering popularity. One of those menu essentials is twice baked potatoes. The number of family members ebbs and flows from year to year, but we can expect between twenty and thirty for dinner. That's a lot of dinner guests in my book. 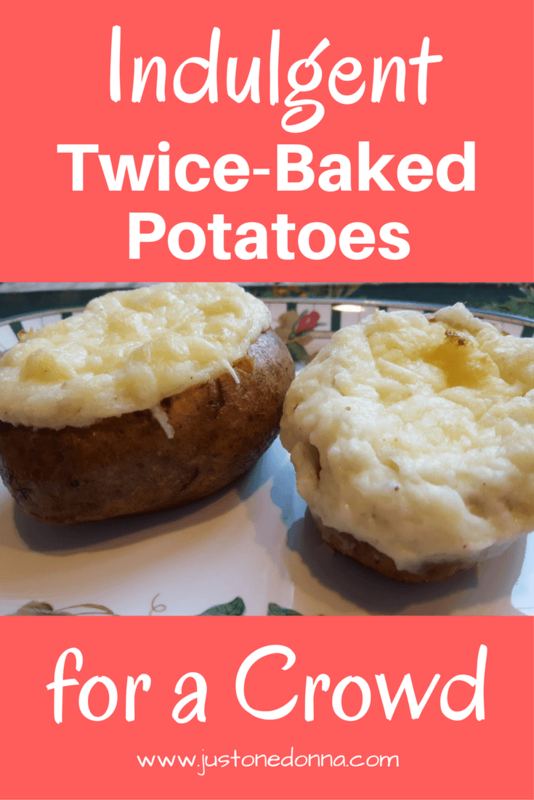 The good news is these yummy twice-baked potatoes can be made in advance and that exactly what I do. You can, too. Our twice-baked potatoes recipe is a simple one. You'll just need russet potatoes, butter, sour cream and sharp cheddar cheese in large quantity. These are not diet-friendly potatoes, so please don't shame me for the ingredients. We reserve these over-the-top potatoes for celebratory meals where a little over-indulgence is expected and encouraged. That makes them perfect for our holiday table. A helper is a good idea when making these twice stuffed potatoes for a crowd. 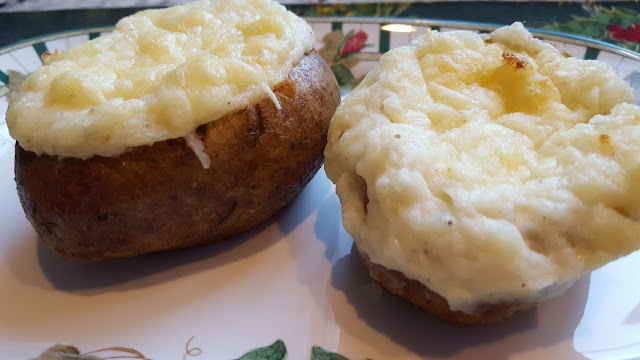 Hubby and I set aside an afternoon about two weeks before Christmas to prepare our twice baked potatoes. We set up an assembly line to speed the process. 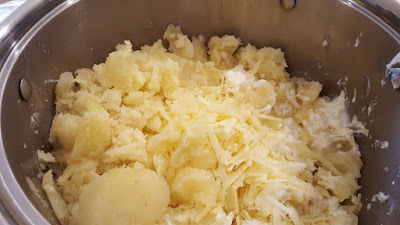 The potato filling is prepared while the potatoes are hot, so working quickly is essential. 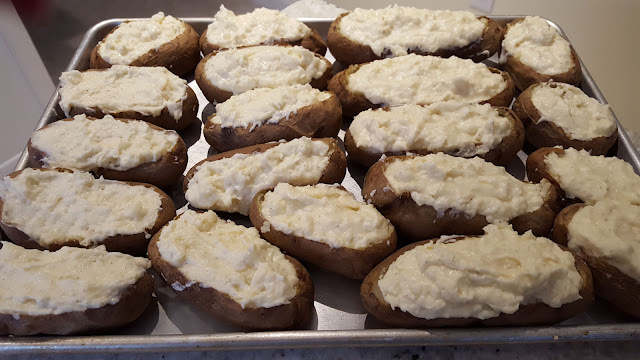 As the potatoes are stuffed they get placed on a sheet pan to freeze, so you'll want to be sure you have enough room in your freezer for your potatoes before you get started. Once the potatoes are frozen you can wrap each one individually in plastic wrap for longer storage in your freezer. That way you can have twice baked potatoes any time you crave a little yummy indulgence. You'll find you have a lot more stuffing than you have potato skins to fill. That's a good thing. The extra filling makes a delicious twice baked potato casserole. You can freeze the filling for a later date or serve it in addition to the twice baked potatoes in the skin. There's a great deal of wiggle room in this recipe. You are encouraged to customize the stuffing mixture to your preference. The amounts will change based on the number of potatoes you make so I encourage you to use my recipe as a guide and adjust as you go. Tasting is essential to the process. When the filling tastes good to you it is ready to stuff back into the potato skins. Preheat your oven to 375 degrees F. Wash and prick the russet potatoes with a fork. Place the potatoes in your oven and bake until soft and cooked through, about one hour. 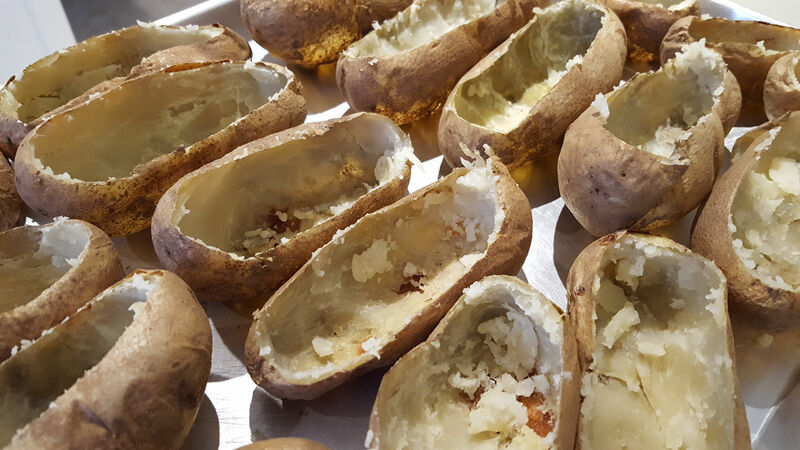 Slice the tops off of the baked potatoes, one potato at a time. Scoop the potato from the skin into a large bowl, leaving a thin layer of potato to give the skin some structure. Work quickly because you want to make your filling while the potato is hot. Once you have a third of the potato scooped from the skins, add about one-third of the butter, sour cream, salt, and pepper to the pot. Reserve one pound of the shredded cheese to top the potatoes. Add a third of the remaining cheddar cheese to the bowl. Mash the contents of the pot together until well mixed. Continue scooping the potato from the skin working on the next third of baked potatoes, adding to the mixture in the bowl. Mix in a third of the remaining ingredients, until well combined. Finish with the remaining third of potatoes and ingredients, as needed. Taste and adjust the salt and pepper. Once your filling is well-mixed and smooth, scoop the filling back into the potato skins. Place the filled potatoes onto a sheet pan for freezing or chilling. If freezing long-term, wrap each potato individually in plastic wrap after they have frozen through. Place in a freezer bag until ready to rebake. Preheat your oven to 350 degrees F. Top the thawed, stuffed potatoes with shredded sharp cheddar cheese. Bake on the center rack of your oven until the cheese is melted and the potatoes are heated through. Serve your twice baked potatoes with one of these beef tenderloin dinners. These asiago potatoes are a yummy indulgence, too. Thank you for sharing this post with your social media friends. I appreciate your shares on Facebook, Twitter, Pinterest, and Yummly.